This is the case with an ordinary plant, who everybody knows – chamomile! It’s nothing special at first sight, but it hides inside a wide variety of benefits, which would be wise to utilize. Today I will tell you about 8 amazing chamomile oil uses for your skin. 1. 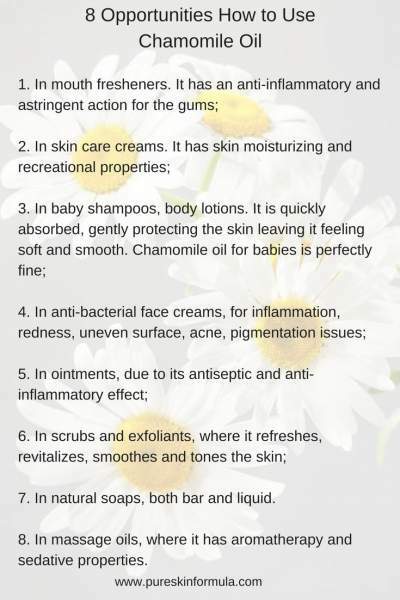 What is chamomile oil? 2. 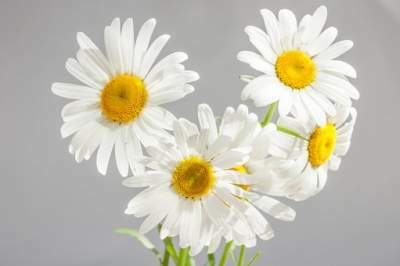 Which are German chamomile essential oil benefits for skin? 3. Why should you use chamomile oil and get an advantage of its properties? 4. Is chamomile oil a good option for babies? 5. Is chamomile oil appropriate for skin lightening? Chamoline is a flower, plant, and herb. You can see it under different names. Its official one is Matricaria chamomilla, but other popular titles are Chamomilla Recutita, German chamomile, Italian Camomilla, White Chamomille. Are you lost? No worries – remember that all these variations lead to two plants from one Chamomile family, which have similar properties, but still some nuances! As German Chamomile is even better for cosmetic purposes than the Roman “cousin,” our story today will be about the German version. Matricaria chamomilla is widely spread around the world and is known from ancient times. Maybe you have used it as s delicious herbal tea! Indeed, chamomile has an anti-inflammatory, anti-bacterial, and sedative effect, when you are stressed, or have a headache. Moms can use chamomile tea to relieve baby’s colics and stomachache or treat baby’s nose or eyes in case of cold or inflammation. You can remove irritation on toddler’s skin, massaging damaged areas with a tea from chamomile. It can soothe, calm and nourish your skin if it is dry, or dehydrated. So far, so good. But maybe you are not familiar, about the magical chemistry of chamomile oil. What about chamomile oil chemistry? In fact, we, human beings, have found a way to extract oil from the flowers of this fantastic plant! When using chamomile oil, you go one step further in utilizing the power of the flower. Let’s see what is under the hood. The critical magic here is called bisabolol. As it contains panthenol, it has skin healing properties! Panthenol helps with skin sunburns and burns, cuts and wounds. It moisturizes skin, improves elasticity, and has an anti-inflammatory, anti-itching, and anti-bacterial effect. Not only is bisabolol so generous regarding your healthy skin, but it also has a lovely floral aroma, which is so valuable for a cosmetic product! Bisabolol is facilitating skin absorption of other compounds, like anti-oxidants. Chamomile oil contains also compounds from the group of flavonoids, like quercetin, apigenin, patuletin, luteolin. All of them are powerful skin healing agents. 1. It improves the condition of the dehydrated and damaged skin, decreasing skin peeling, and rebuilding its elasticity. 2. It has sedative, neurotherapeutic properties, reducing the feeling of sadness, and setting you in a happier mood:) Do you remember the delicate aroma, I’ve mentioned before? It certainly helps. 3. It supports skin recreation from cuts and wounds. 4. It helps for skin infections, due to its natural antibiotic, antiseptic, and anti-inflammatory properties. 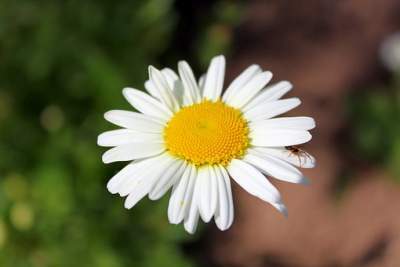 5 It reduces skin scars and marks; and yes, it is a good option to have on your side chamomile oil for skin lightening. 8 opportunities how to use chamomile oil? 7. In natural soaps, both bar and liquid. 8. In massage oils, where it has aromatherapy and sedative properties. You can see how universal “cure” for our skin is chamomile flower, either used as a herb, oil, or extract! It covers a big scope of skin issues, and it would be a big loss, if not included in cosmetic formulas. What you need to do is to inspect the labels of high-quality natural cosmetic products. If you notice chamomile among the ingredients, you will know the qualities it brings on your skin care. Chamomile oil blends well with many other carrier and essential oils, like rose oil, lavender oil, and neroli oil. The task is halfway completed. You have all info needed. You know what chamomile is. You “looked” inside into the chamomile compounds. You are familiar with five significant chamomile oil benefits for the skin. And mostly, you are “armed” with 8 amazing chamomile oil uses for your skin! But all your knowledge is pointless if you don’t use it! The second half of the task is to TAKE ACTION. Go find products with chamomile, try which work for you, and include in your skincare! I would love to hear from you! What do you think of chamomile? Leave me a comment, and I will answer you! Ok, so I have a lot of different essential oils, but can you believe I don’t have chamomile? After reading this post, I believe that will be changing! 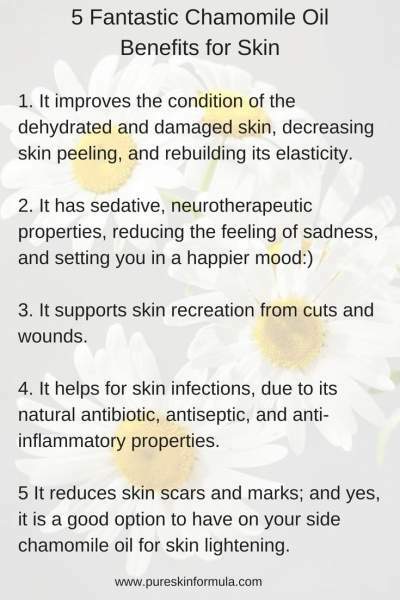 It looks like there are tons of benefits to chamomile, especially for the skin. Thank you for the information! Thank you for your comment! I am happy you found useful info here. I’m once again impressed by your very informative posts. I wasn’t aware of the many different oils there are – just as many as plants on earth, I start to believe. It sounds interesting to wash the hair with chamomile tea. I wonder should I wash my hair with a shampoo first, rinse away the shampoo with water and after that rinse the hair with warm chamomile tea? Thank you for your comment! I am thrilled that you learned about chamomile oil:) There are so many natural solutions, indeed! And we should use them smartly and benefit from them! To your question: Yes, you can first wash your hair with shampoo, and then apply chamomile tea!